AJKA TOSOKBEREND, HUNGARY. 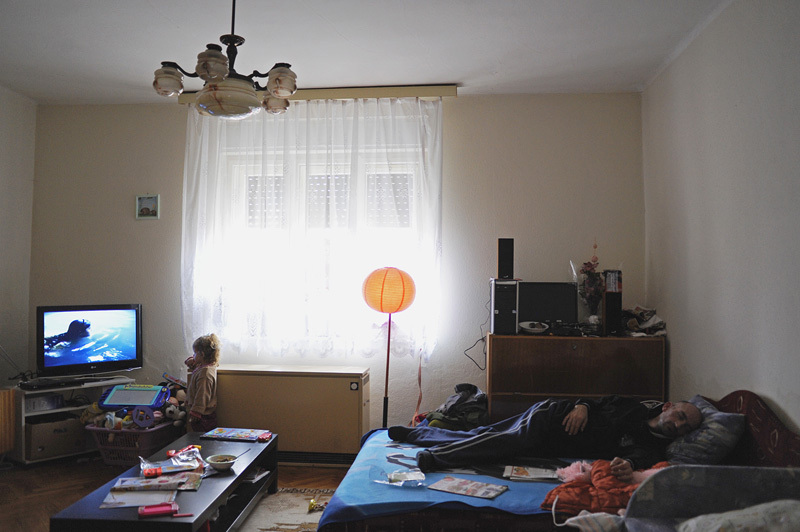 Dora Jazmin Juhasz, 3, watches television as her father, Zoltan Juhasz, 33, sleeps in their temporary home on November 23, 2010; Dora's fourteen month old younger sister, Angyalka, was the youngest victim of an industrial accident at the MAL plant in nearby Ajka, Hungary on October 4, 2010 which sent a torrent of toxic red alumina sludge gushing through their previous home in Devecser, Hungary. Zoltan has burns that cover 67% of his body due to the accident and despite nearly drowning in the sludge save for a single arm, Dora survived without injury.